If you’re thinking about giving your garden a little renovation, or just want to tidy up all the weeds, then you’re going to want to check out our range of multi garden tools. 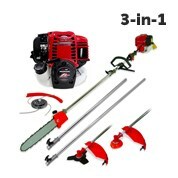 Our wide range offers a selection of blade sets that are available in different engine sizes to suit your every needs. Each set comes with a range of different trimmers to target specific areas in your garden. 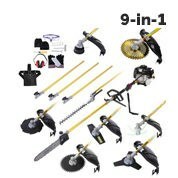 With this kit you’ll have your garden looking brand new without having to break the bank! 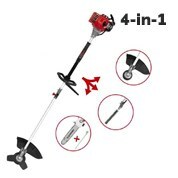 The ultimate 6-in-1 Petrol Multi Tool Pole Garden Trimmer 49cc runs on a 4 stroke petrol engine, and comes with 6 chainsaw and trimmer attachments. Why have a garage full of different tools, when you only need this one! As a bonus the 4- stroke engine is not only demonstrably quieter than two strokes, it also uses around half the amount of fuel. 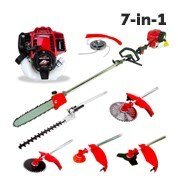 Alternatively if you’re wanting something with a few more tools check out the Black Max 8-in-1 Multi Tool Garden Trimmer Kit 52C, it is not only powerful but can get multipole jobs done with a line trimming head, pole saw and other attachments. It has a fuel capacity of 1.2L to ensure you can get all your gardening jobs done without having to continuously keep refilling. Here at My Deal Australia we understand just how busy you are, and spending the week running to different hardware stores isn’t always an option. That’s why we offer a wide range of tools and equipment that you can buy from the comfort of your own home. We ship to major cities like Melbourne, Sydney, Perth, Brisbane and The Gold Coast very quickly and to regional areas with some time allowance. If you have any other questions about our product range please don’t hesitate to contact our friendly customer service line on (03) 9998 6805 or check out our FAQ page for more details.